Today Spiritual Intelligence is considered by many to be the most important of our intelligences, and has the power to transform our life, civilization, the planet and the course of history. How do we move from immature ego-driven behaviors to more mature higher self-driven - from competition to co-creation? How can we develop the ability to hear the voice of our higher self, to understand and transcend the voice of our ego, and to be guided by deep wisdom and compassion?Souldrama®, an outgrowth of psychodrama, is an experiential group method that aligns all three of our intelligences, the rational, emotional and spiritual to move past the resistance in our lives and to ignite our spiritual intelligence. Multiculturally, it crosses diversity by putting spirituality into action within the group promoting cross cultural growth and understanding through connection, creativity and spontaneity. This new holistic group action model has been published as a new action model for the 12-step recovery program (Miller, 2013). 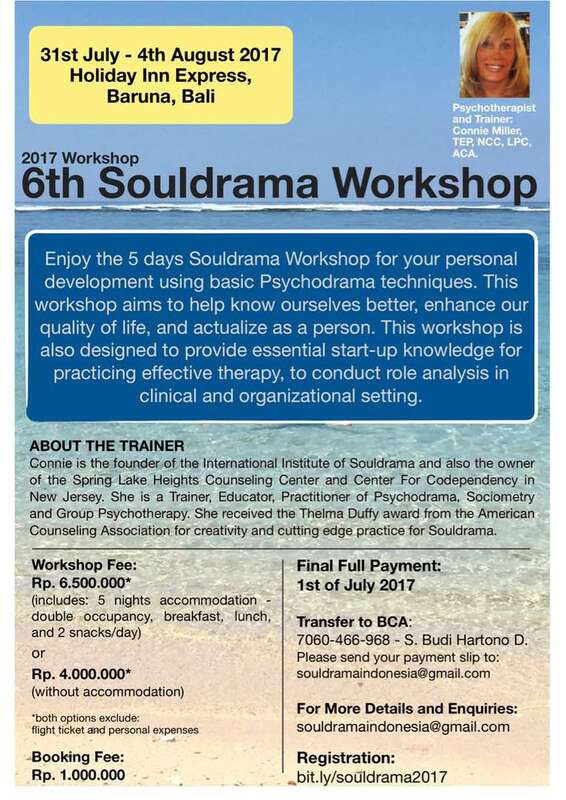 As an international program, it has been presented many times for psychologists, faculty’s in Indonesia, Holland, Portugal, Brazil, Lithuania, Greece, Italy, Latvia, Lithuania, Holland, England, India and Mexico. We are all agents of change. The task of this generation is to cut through the illusion that we live in separate worlds. Today, if we want to change systems, we have to change human behavior; however, human behavior is not so easily changed. The main responsibility of a true group leader today is to change the motivations that drive behavior, enabling people to achieve real transformation. The only way the world will be transformed is for individuals to make changes in individual levels of consciousness . A truly intelligent person is not one who can simply memorize words and numbers; it is someone who can relate 'intelligently' to all the opportunities, simulations and problems provided by the environment. We can develop our rational intelligence with the internet and computers by ourselves; we can access our Emotional Intelligence by ourselves; however, we cannot develop our Spiritual Intelligence alone for the key words here are to relate and to interact. No matter where we live, a large and important part of our spiritual journey is the power and the fellowship of the group. Our need to talk, interact and simply be with each other is part of our development. If we want to be sensitive to others and make our intentions conscious, we need to examine ourselves in relationship to others. A group is the most feasible method for initiating, improving and evaluating connections. In a world that is rapidly changing, in both technology and in the social and cultural realms, social norms are stretched, roles are changing and people are looking globally to find a sense of meaning, social and spiritual connectedness. This requires the development of the capacity for creativity, and that in turn involves an integration of language, rationality, perception, intuition, emotion, imagery, and the felt sense of the body in action. In other words, we need to balance the left hemisphere of the brain, or our rational intelligence, which deals more with language and reason, with the right hemisphere or our spiritual intelligence, intuition, imagery, emotion, and action, bridging the gap between the right and left hemispheres by working through the expression of our feelings, our emotional intelligence. It is then that we will be able to awaken our higher purpose and create spiritually intelligent leadership. Throughout our development and the development of technology the left-brain functions have been increasingly emphasized and the right-brain functions relatively neglected. Research in creativity in the last century has shown that both left- and right-brain functioning is needed for optimal mental flexibility, especially that which has to include considerations of human relationships, morale, motivation, and a sense of team spirit or community. $ 550 for international participants based on double room occupancy. $60 extra for a private room. 9-12:30PM and 4:30-7:00 PM beginning July 31, Monday. We will have one afternoon off. Check out Aug 5, 2017 at noon. Please contact the hotel directly if you wish to arrive earlier.